Observed in South Nandi Forest, Kenya, April 2013. After just a half-dozen visits to Kenya, I must be a bit crazy to think I can also try to learn about the fungi. With easily tens of thousands of species, the best I can do at this point is gather photos of several distinctive or beautiful species. 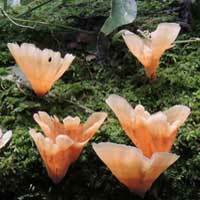 This is the first one and resembles the Orange Peel Fungus found in California. 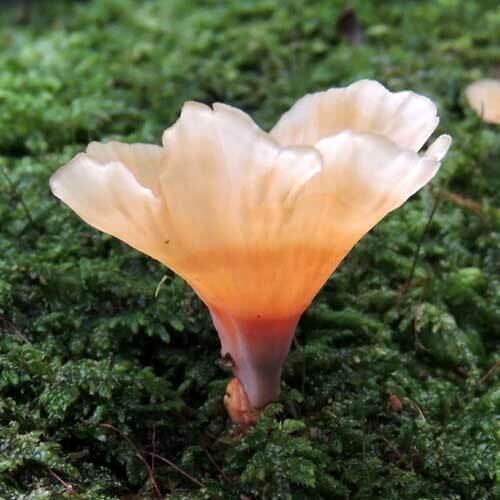 Many were erupting through a carpet of bryophytes growing on a wet, rotting log in the forest understory.